First documented by Charles E. Brown (founder of the Wisconsin Archaeological Society and museum director at the State Historical Society.) 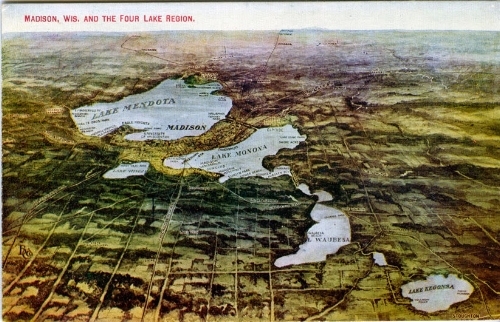 in his 1942 pamphlet on Wisconsin Sea Serpents entitled, “Sea Serpents: Wisconsin Occurrences of these Weird Water Monsters in the Four Lakes, Rock, Red Cedar, Koshkonong, Geneva, Elkhart, Michigan, and Other Lakes”, the Lake Waubesa Monster is said to have made its first “official” appearance in the early 1920’s. The Monongahela River, a 130mi long river that runs between both West Virginia and Pennsylvania, has long had legends of strange aquatic beasts associated with it. Much like any large body of water within North America, the Monongahela (often times referred to as “The Mon”) is said to have a resident monster dwelling beneath its surface. Its name is Ogua. In February 1814 on a trip up the Mississippi River, famous American naturalist and artist, John James Audubon (namesake of the Audubon Society) laid eyes upon a bird that he had never seen before. This was not unusual for Audubon for he would identify 25 new species of birds during his lifetime, but what made this bird unique is that it has only ever been veritably seen four times.